Today, I want to talk about a special plant that I am sure you will love when you’ll know what it can do for your household. I am talking about an indoor Venus Flytrap. and yes, it is amazing just like its name because that’s what it does. It traps the flies and it eats them. 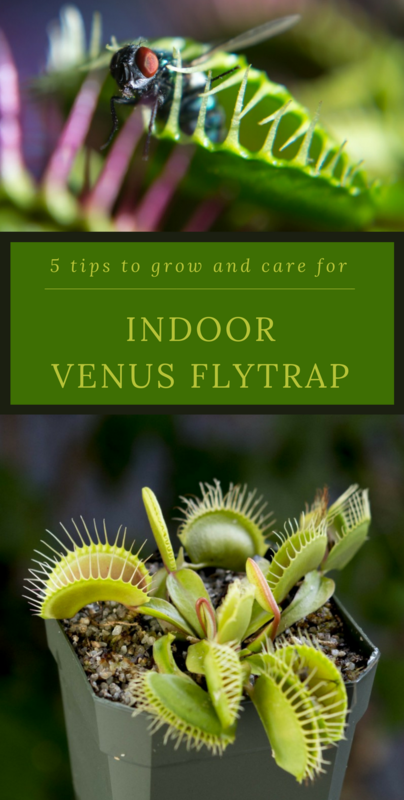 No, it is not science fiction, keep reading and see 5 tips to grow and care for an indoor Venus Flytrap, you will not regret it. First off, let me tell you the story of why I bought this plant and how it helped me in the long run. As always, every fall, a lot of fruit flies and fungus gnats show up due to my indoor orchids. After trying a lot of home remedies and natural solutions, I came across this plant and its beneficial properties. Thus, let me tell, a Venus flytrap is not only a gorgeous plant, it also takes care of these little invading pests. I didn’t want to use any more pesticides on my plants, so this Venus flytrap was like a godsend to me. Let’s see how you should take care of this plant to get the most of it. 1. The first tip is taking it easy. As you will see, you should care for this plant slowly and easy. Let it sit on the shelf for a day and make sure you keep the lid off so it can adapt to the low humidity. After a day, you should take it out of its cube and you will see it already has mold on top of the soil. Here’s the best part, they love it like this, keep reading and see why. 2. Their natural habitat is swamps and bogs. Thus, a Venus flytrap will grow best in a soil that has very poor nutrients. Hence, you can figure by now that this kind of soil is perfect for this plant because it creates proper conditions for eating bugs. Thus, you need to make sure to repot your Venus Flytrap in an unenriched soil. Hence, you should be mixing a ratio of 1:1 of peat moss and perlite. You should also make sure you repot in a tall pot because this plant will have deep roots and it will require a good drainage system. Despite their natural habitat being swamps and bogs, you should not drown this plant in a wet environment because its roots will start to rot. That’s right, you should never use tap water for a Venus Flytrap. The dissolved minerals and chlorine from the tap water might burn its roots. Your Venus flytrap loves the sun so you should make sure it gets a lot of sun for as long as they can. Thus, begin by placing it in a good location with filtered light for a couple of days. Then, gradually, you should bring it out to full sun. This gradual process is necessary because after living under fluorescent lights, a bright and full sun could cause the leaves to burn, killing the plant. So my tip for is just taking it easy and your plant will adapt immediately. Thus, give it time by placing it for an hour in a direct sun one day, then two hours the next day, and so on. You should not feed it with anything else then insects. How crazy is that? Thus, try feeding a Venus flytrap with spiders, flies, ants or beetles, these are the most nutritious than any other insects. However, you should not kill the bugs before. There is another thing you should know about your Venus flytrap. It will go dormant for around 4 months in winter so don’t be scared that it is dying. Thus, make sure you trim the black stems off so they can’t rot and allow the fungus to grow. You could also skip this period; however, your plant won’t grow as strong or live as long if you don’t allow it to follow its natural cycle. You can leave it in its pot for the winter but make sure to treat with a fungicide before you store it away on a basement, garage, or a cold room. You could also keep in the fridge, which is a great alternative if you don’t have other options. As a conclusion, do not think for a second that growing and taking care of an indoor Venus Flytraps is impossible. If you are taking it easy, it is actually very easy to grow once you understand its basic needs. Once you met these needs, you will not only have a beautiful plant but also a great plant eating off your flying pests.